It’s been forever since I’ve shared a kitchen product I love, but it’s also been forever since I’ve found something new that I’m in love with. Today, I’m sharing Bee’s Wrap Sustainable Food Storage. I’m an Amazon affiliate, so I do get a little kickback if you decided to purchase Bee’s Wrap using my links. If you want to skip my background story and get to my info about the Bee’s Wrap, you’ll want to scroll down a bit. I have a story to tell about how I found the Bee’s Wrap first. As most of you know, I had a stroke 2 months ago. The stroke was centered in the Cerebellar region, which controls balance and motor function. I look fine, when I’m walking (most of the time), but I have a dizzy feeling in my head and sometimes sway, find myself off balance, or take a little tumble. Grocery stores are the WORST! Turning my head as I walk causes all sorts of problems like extreme dizziness and nausea, and you’re constantly turning your head to look for the items you need when you are in the aisles. Back to the story. My physical therapist gave me some homework. She said to walk down the mall on a day when it’s not too busy. Walk, looking straight ahead, and once in a while go ahead and glance into a store. She thought that would be a good step toward being able to do the grocery store more than 5 minutes. It started out ok. I started with the outdoor portion of the mall because outdoors are always better for me. Unfortunately, there was stamped concrete and the business was too much for my brain. I sat down in a little chair because I was starting to feel like I was going to fall over and… HEY, there’s Williams Sonoma. It sucked me in, Friends. I started to look for some gifts I needed and spotted the Bees Wrap on the sale rack. I have to tell you, I have been looking for Bee’s Wrap for about 2 years. I saw it in a magazine. I have put it on my Christmas list many times, but no one can ever find it. So, when I saw the Bee’s Wrap sitting there, I had to buy it. I bake a lot of bread, so the Bee’s Wrap bread wrap was the way to go. Saving the environment, one Bee’s Wrap at a time! My son, who doesn’t really care much about kitchen related purchases, commented on how fresh the two day old banana bread tasted. I was just happy that the bread wasn’t wrapped in plastic wrap. 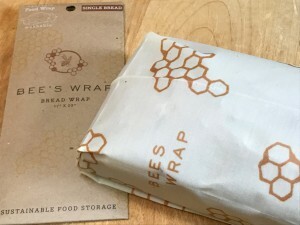 To wash and reuse the Bee’s Wrap, the directions say to wash with cold water and a little dish soap, hang to dry, fold to store, and reuse for about 1 year. Friends, I’m saving the planet one Bee’s Wrap at a time. I know you want to do the same!